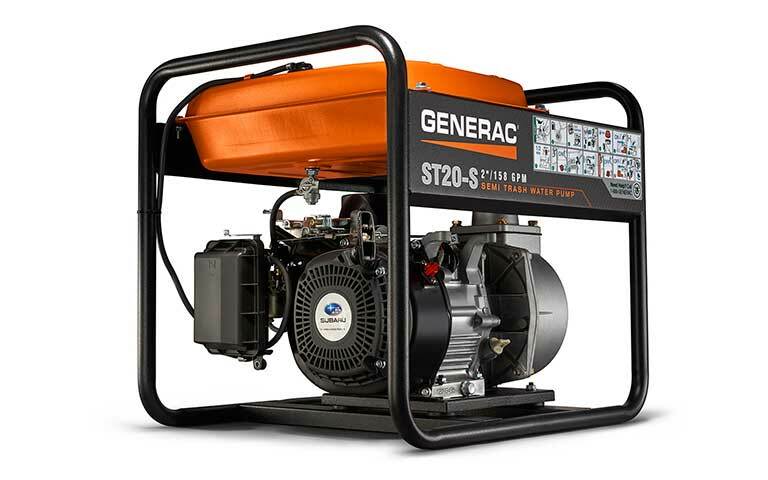 Specifically engineered to handle muddy or sandy water, the ST20-S is powered by a 169cc Subaru engine that pumps up to 158 gallons per minute. With features such as low-oil shut down, custom Easy Prime™ funnel design for quick and easy priming, and a large fuel tank with integrated fuel gauge, it’s both durable and easy to use. Rated 5 out of 5 by bowman from easy setup and starting awesome pump was easy to setup and start used for emptying my crawl space due to flooding . it took 3 1/2 hrs to completely drain my crawlspace under a 1600 sq.ft. home due to flooding from river. pump still had a 1/2 tank of fuel when finished couldn't believe how well it did outperformed a rental pump used the last time this occurred . highly recommend this pump to anybody who has flooding issues . it was worth every penny spent to purchase don't know why i didn't do this sooner. thanks again Generac for an awesome product!!!! Rated 5 out of 5 by Jimbo from Awesome product. Bought this to pump out my 1 acre pond. Did a wonderful job running continuously for 3 days in 90 degree weather. Only issue was the pump drain plug. Appears it got too hot and has melted the threads and damaged the o-ring seal. Now to find and order parts for it. Still highly recommend this product. Rated 5 out of 5 by Cheryl from Very efficient. The product was able to clear about 18" of standing water in a very short amount of time. It is very efficient and runs a long time on one tank of fuel. I would highly recommend it for anyone needing to clear standing water. The reason for the standing water was accumulation of two inches of rain in Wisconsin in the winter when the ground is frozen and the water has no where to go. ST20S-6919 is rated 4.8 out of 5 by 4.